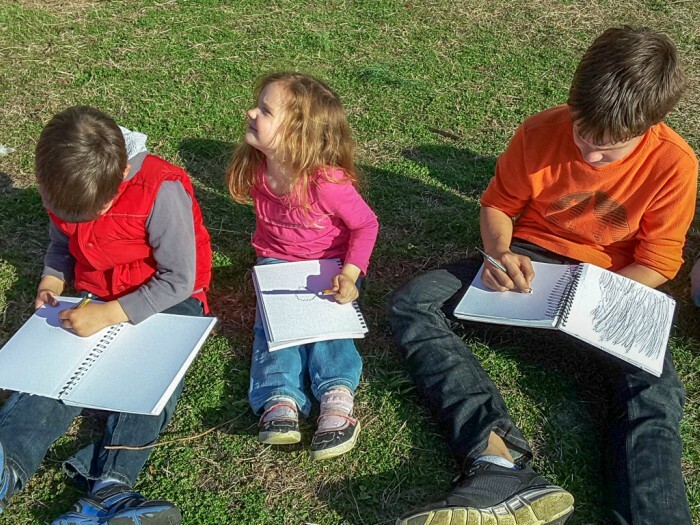 Yes, You Can Do Nature Study with Multiple Ages! One of the best things about nature study is that it works WONDERFULLY when teaching multiple ages at once. I have a confession to make. I’ve been a homeschool mom for eight years now, and I’ve never once done a nature study with my kids. Not once. Not even a nature walk. To be honest, I felt a little overwhelmed about making time for nature with eight kids at so many different grade levels. In my mind, “nature study” meant that we’d wander around our suburban neighborhood and the kids would ask me about the rocks and leaves they found and I’d have no idea what to tell them. I’m glad to know that’s not actually how nature studies have to work! 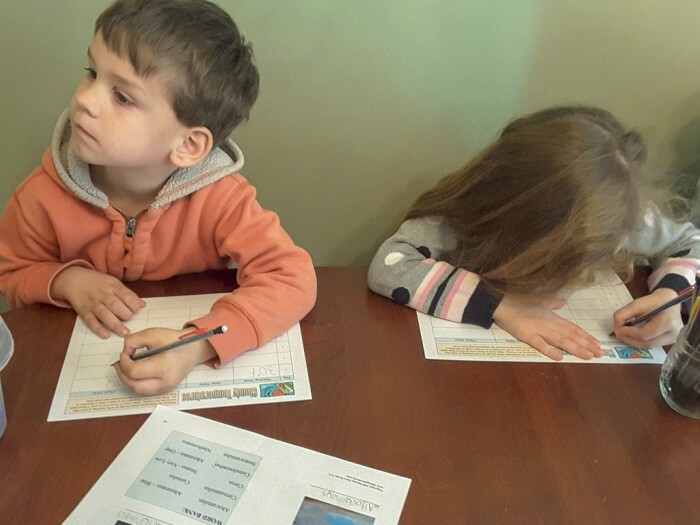 We love unit studies in our homeschool. And we especially love learning all together as a group. When I finally got up the courage to investigate NaturExplorers for myself, I realized that it was precisely what we needed – a nature-focused unit study, perfectly adaptable to all ages. I read through the topics with my kids and asked them which subject sounded most interesting. I should have guessed – they want to do them all! But as it was still technically winter here in central Virginia, we decided to start with Captivating Clouds. I was thrilled to find that the guide was packed full of all kinds of theme-related content. I requested books from our library. I bookmarked YouTube videos, clips of music, and images of famous art related to clouds. I even copied down Scripture references on post-it notes. Of course, the day I planned to begin the study, it was below freezing … and also cloudless. This reminds me of another “ah ha moment” about nature study, courtesy of NaturExplorers: It doesn’t all have to happen outside! We routinely gather for Bible time first thing in the morning. I decided to set aside our regular schedule of Bible reading and we looked up scripture verses related to clouds. I put out a bunch of post-it notes with Scripture references and anyone who was interested and willing grabbed one or two. They looked up the passages and marked them with the post-it notes and we took turns reading and considering how clouds are discussed in the Bible and what they represent. The next part of our day is “table school.” Everyone from the middle-schooler down to the preschooler gathers around the dining room table and we learn together about our topic of the day. We affectionately refer to our homeschooling method as “family schooling” since we try to find creative ways to include everyone in our learning activities. The NaturExplorers guide has proved to be an easy way to do this! We watched a video from the National Weather Center about clouds and one from our favorite YouTube Channel, It’s OK to Be Smart, about why clouds stay up. The second video mentioned the adventures of William Rankin, a fighter pilot who ejected from his damaged aircraft right into a thunderstorm. Of course, like good homeschoolers, we had to take a rabbit trail and watch a video about his experience as well! 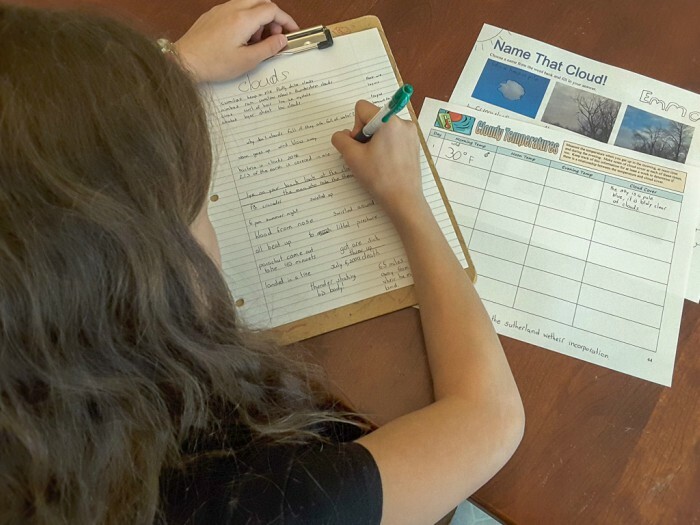 Thankfully, Captivating Clouds includes a wealth of ready-made printable activities, so I printed off copies of a cloud-identification sheet and also a chart that we can use to track the daily temperature and cloud cover. Even my two pre-readers wanted to complete the cloud-identification activity. We looked at the pictures provided and when we agreed on the answer to each picture, I wrote it on the board. The little ones copied down about half of the answers before they got bored and didn’t want to write anymore. No problem! Whatever they did was a bonus, so I didn’t feel the need to require them to complete it. At the end of table school I always have the oldest four children write narrations on the topic we’ve studied. The lengths vary, as do the handwriting, grammar, and mechanics, but that’s OK. My primary goal is just to give each child a chance to cement his learning by explaining it in his own words. In the days that followed (still cold) we continued to learn more about clouds with all kinds of activities included in the NaturExplorers guide. We took a few brief trips out onto the front porch to inspect and identify the daily cloud-viewing opportunities. One of the kids’ favorites was examining art featuring clouds. As we suspected, there was one particular type of cloud shown in many of the artworks. Can you guess which kind is most popular? We enjoyed looking at the brushstrokes and techniques artists used to convey the impressions and characteristics of the clouds. We also listened to a piece of music inspired by clouds and the kids drew what they pictured as they listened. Some of the drawings were cloud-related, and some weren’t, which was interesting to observe. They could all “hear” the clouds symbolized in the music, though! Finally, after almost two weeks of waiting, we had a day of lovely weather. By the time we were ready to do our nature activity, the neighborhood friends had already arrived home on the bus and were out to play. I hated to pull my kids away from their friends on this gorgeous day, so instead, we invited the neighborhood kids to join us for a last bit of homeschooling! I had twelve kids in my front yard with art journals or art paper on clipboards. Some rested on their backs to observe clouds. Some stood so they could turn in all directions and see how the clouds looked different in different directions towards the horizon. Some settled on their stomachs to sketch pictures of the images and shapes they saw in the clouds. There where children who preferred to observe and draw alone, silently. While others preferred to work in pairs or threes, sharing what they saw, pointing out shapes, colors, and other characteristics of our cloud views that day. After such a successful and enjoyable experience doing nature study with multiple ages, I no longer think of it as an intimidating, beyond-my-reach activity to include in our homeschool. I’m looking forward to other opportunities to use NaturExplorers guides to dive deep into other nature topics! Lynna is the mother of eight, great, always-homeschooled kiddos ranging from middle school to chunky baby. She blogs about the freedom and flexibility of this home education lifestyle at Homeschooling without Training Wheels. 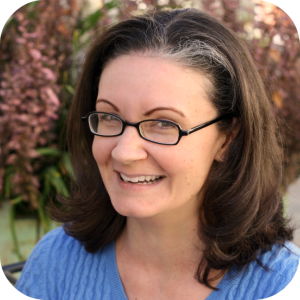 If you need some encouragement in the journey of teaching multiple ages, check out Lynna’s free eBook “5 Myths that are Killing Your Multi-Age Homeschool“.